It seems Facebook has a history of doing this to other people. You can read in Lee Cambells post from 2 years back and there are more of similar nature in the link. Not much has changed it appears, since our experience follows roughly the same path. In early April 2018 Facebook deleted our VooGlue page without warning or notice, and no amount of emails to them has provided any reason. The page was 4 years old, had many hundreds of posts in its history and an audience of 20,000. In mid April we started a new Facebook page from scratch with Zero followers, we built it out with our blog history and stated to build our audience, then on 15th May Facebook did it again! Deleting our page without recourse! That’s when we decided to reduce our reliance Facebook. It seems we are in good company, though for different reasons. Some major companies are deleting their Facebook pages in protest to reported data privacy breaches under the hashtag #DeleteFacebook. Our reason is control of our post publishing history. From now on our blog posts will be here on this blog were we have full control and we may re-post them on Facebook when we have a page there. If we are maintaining a Facebook page then the link to it will be below, otherwise it will say “No Facebook Link At This Time”. Either way and you see all our blog post history right here. Enjoy! The VooGlue App has an easy ‘Add’ button so that users anywhere can add content. Of course we have checks and balances in place, see our whitepaper for some details. Even thought the prototype web app is being adopted by users already, the mobile app will make VooGlue’s existing prototype web app much faster and easier to use. VooGlue mobile app coding development is well underway! In a few more weeks and the first version of the VooGlue App should be LIVE! The next step is make your own personal Ethereum wallet. This wallet is separate from a centralized exchange where you may have purchased Bitcoin or Ethereum. You’ll need to send your ETH from that centralized exchange to this wallet once you’ve set it up. There are many ways to make an Ethereum wallet, but a currently popular and user-friendly one is made through a service called MetaMask, which runs as an extension to your web browser. Here are step-by-step instructions for setting up and using an Ethereum wallet with MetaMask. When you make the wallet through MetaMask, remember to follow the best practices for storing your passwords / private keys described in Entering the Cryptocurrency Ecosystem. When you have setup your personal Ethereum wallet and funded it with ETH (sent from the centralized exchange you purchased it, from your friend, from a cryptocurrency ATM, etc. ), you are ready to buy VGC. NOTE: Even if you intend to purchase VGC using Bitcoin rather than Ethereum, you still need to input a valid Ethereum address. VGC tokens are an ERC-20 standard token and as such are held and managed on the Ethereum public blockchain. Once you have accessed your ether wallet, you can send tokens to the VooGlue ICO contract address. Again, here are step-by-step instructions for setting up and using an Ethereum wallet with MetaMask if you don’t already know how. Input the VooGlue ICO contract address in the “To Address” box (this will be displayed in the dashboard at https://vooglue.io/token-sale/ ). Indicate how much ETH you would like to send. Press “Generate Transaction” and confirm. You can also purchase VGC tokens using Bitcoin. To do this you can send your BTC from any wallet. The address you send to will be displayed in the VooGlue investor dashboard at https://vooglue.io/token-sale/. Your VGC tokens will automatically be sent to the Ethereum address you setup when you registered in the dashboard. Thats, when the VooGlue token sale has been completed, your VGC tokens will be visible on the Ethereum public blockchain. 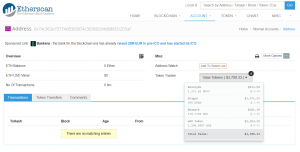 At that time an easy way to view the VGC in your wallet is to simply visit https://etherscan.io/ and enter your public Ethereum address into the box at the top-right. In the “Token Tracker” drop-down box, you can see all of the ERC-20 Tokens that have been sent to your address. ***NOTE: Depending on the stage of congestion of the Ethereum network, it may take several minutes from the time you send Ether to the VooGlue ICO contract address until you receive VGC in your wallet.